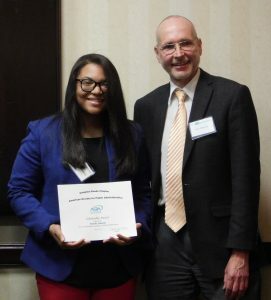 On Thursday, May 18, the Hampton Roads Chapter of the American Society for Public Administration (HR-ASPA) awarded their Chapter scholarship to Taniesha “Tanny” Simmons ’18, Robertson School of Government. The scholarship recognizes excellence in public service and takes into consideration work experience, extracurricular activities in civic and community development, career goals and overall academic performance when choosing a candidate. Simmons proved to exceed all expectations. As a Master of Public Administration (MPA) student at Regent, Simmons hopes the award brings more recognition to the program. Simmons grew up in Alexandria, Virginia, and moved to Hampton Roads to obtain a bachelor’s degree in political science and international relations with a concentration in Russian affairs from Old Dominion University. In 2015, she was an intern at the U.N. General Assembly and worked for Virginia Sen. John Cosgrove and Delegate Jay Leftwich in Chesapeake. It was during her time there that she grew a passion for public service. After finishing her internship and graduating, Simmons was offered a job in enrollment management at Regent. She began the job in August 2015 and enrolled in the master’s in government program two months later. In January 2016, Simmons transitioned into the MPA program to better align her studies and long-term goal of one day becoming the governor of Virginia. In addition to her studies and work, Simmons is a student member of the HR-ASPA, and she is also the president of the International City/County Management Association (ICMA) student chapter locally. She was nominated for the scholarship award by professor and MPA coordinator Dr. Gary E. Roberts.